1729 JAILS COMMITTEE.A Report from the Committee of the House of Commons appointed to enquire into the State of the Gaols of this kingdom, so far as relates to the cruel Usage of the Prisoners; which occasioned the following Trials.Proceedings against John Huggin, Warden of the Fleet [for the Murder of Edward Arne], Thomas Bambridge, Warden of the Fleet [for the Murder of Robert Castell, & for Felony], Richard Corbet, one of the Tipstaffs of the Fleet[an Appeal for the Murder of Robert Castell], and William Acton, Deputy-Keeper & Head Turnkey of the Marshalsea Prison [for the Murder of Thomas Bliss, the Murder of John Bromfield, the Murder of Robert Newton, & the Murder of James Thompson] & Minutes... touching a Charge against Sir Robert Eyre... for personally visiting Thomas Bambridge... whilst he was a Prisoner in Newgate, under a Commitment of the House of Commons, etc, etc. 1728-30. An original article from the Collected State Trials::Large Folio, 1778. Printed T. Wright, Essex Street, Strand; and Sold by G. Kearsley, No 46, near Serjeant's Inn, Fleet Street, London. 1778. Fourth Edition, Disbound. Very Good Condition. 74 pages. A report separated from A Complete Collection of State Trials, not a reprint or copy. Large folio (10 x 16 inches). Printed in double columns. Note; this is an original article separated from the volume, not a reprint or copy. Size: Large folio (10 x 16 inches). 74 pages. Quantity Available: 1. Category: State Trials::Large Folio; True Crime; Printed before 1800; New Arrivals; Inventory No: 231913. ARTHUR CAPELL, 1st EARL OF ESSEX.The Trial of Laurence Braddon and Hugh Speke at the King's Bench for a Misdemeanour, in suborning Witnesses to prove the Earl of Essex was murdered by his Keepers, February 7, 1683. ALONG WITH The Earl of Essex's Innocency and Honour vindicated; in a Letter to a Friend, by Laurence Braddon. 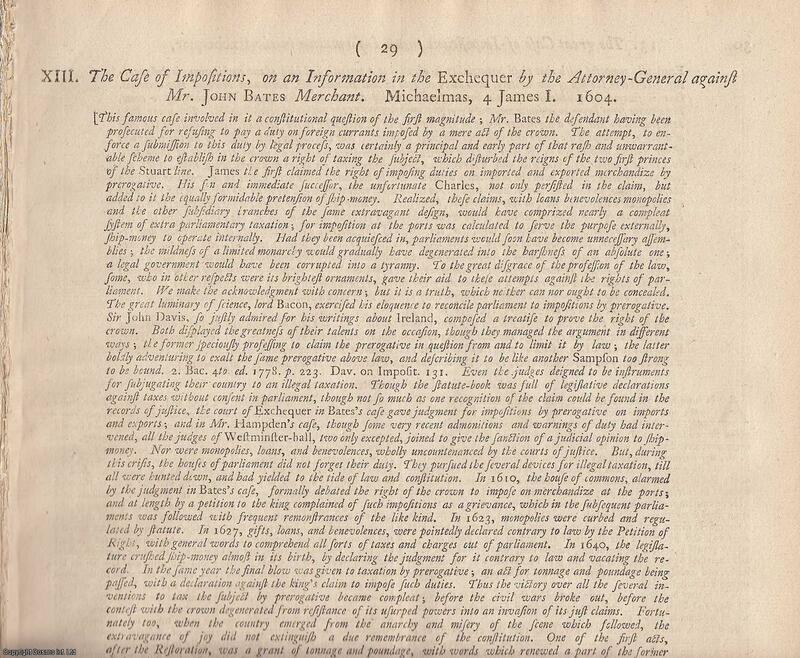 An original article from the Collected State Trials::Large Folio, 1776. Printed T. Wright, Essex Street, Strand; and Sold by G. Kearsley, No 46, near Serjeant's Inn, Fleet Street, London. 1776. Fourth Edition, Disbound. Very Good Condition. 40 pages. A report separated from A Complete Collection of State Trials, not a reprint or copy. Large folio (10 x 16 inches). Printed in double columns. Note; this is an original article separated from the volume, not a reprint or copy. Size: Large folio (10 x 16 inches). 40 pages. Quantity Available: 1. Category: State Trials::Large Folio; True Crime; Printed before 1800; Inventory No: 231868. ATTACK ON DISSENTERS. An Account of what passed most remarkable in the Sessions of Parliament, 1709, in the House of Commons, relating to the Case of Dr. Henry Sacheverell. An original article from the Collected State Trials::Large Folio, 1778. Printed T. Wright, Essex Street, Strand; and Sold by G. Kearsley, No 46, near Serjeant's Inn, Fleet Street, London. 1778. Fourth Edition, Disbound. Very Good Condition. 6 pages. A report separated from A Complete Collection of State Trials, not a reprint or copy. Large folio (10 x 16 inches). Printed in double columns. Note; this is an original article separated from the volume, not a reprint or copy. Size: Large folio (10 x 16 inches). 6 pages. Quantity Available: 1. Category: State Trials::Large Folio; True Crime; Printed before 1800; Inventory No: 231912. AYLESBURY ELECTION CASE - FOUNDATION OF TORT LAW.Proceedings in the House of Commons, House of Peers, and in the Court of Queen's Bench, in the Great Case of Ashby and White, etc. 1703, 1704. An original article from the Collected State Trials::Large Folio, 1778. Printed T. Wright, Essex Street, Strand; and Sold by G. Kearsley, No 46, near Serjeant's Inn, Fleet Street, London. 1778. Fourth Edition, Disbound. Very Good Condition. 44 pages. A report separated from A Complete Collection of State Trials, not a reprint or copy. Large folio (10 x 16 inches). Printed in double columns. Note; this is an original article separated from the volume, not a reprint or copy. Size: Large folio (10 x 16 inches). 44 pages. Quantity Available: 1. Category: State Trials::Large Folio; True Crime; Printed before 1800; New Arrivals; Inventory No: 231901. BANISHMENT OF CLARENDON. The Earl of Clarendon's Vindication of Himself against the Articles of Treason exhibited against him in Parliament. Montpelier, July 24, 1668. An original article from the Collected State Trials::Large Folio, 1778. Printed T. Wright, Essex Street, Strand; and Sold by G. Kearsley, No 46, near Serjeant's Inn, Fleet Street, London. 1778. Fourth Edition, Disbound. Very Good Condition. 25 pages. A report separated from A Complete Collection of State Trials, not a reprint or copy. Large folio (10 x 16 inches). Printed in double columns. Note; this is an original article separated from the volume, not a reprint or copy. Size: Large folio (10 x 16 inches). 25 pages. Quantity Available: 1. Category: State Trials::Large Folio; True Crime; Printed before 1800; New Arrivals; Inventory No: 231907. BIGAMY.The Trial of Elizabeth Duchess Dowager of Kingston, for Bigamy, before the Right Hon. 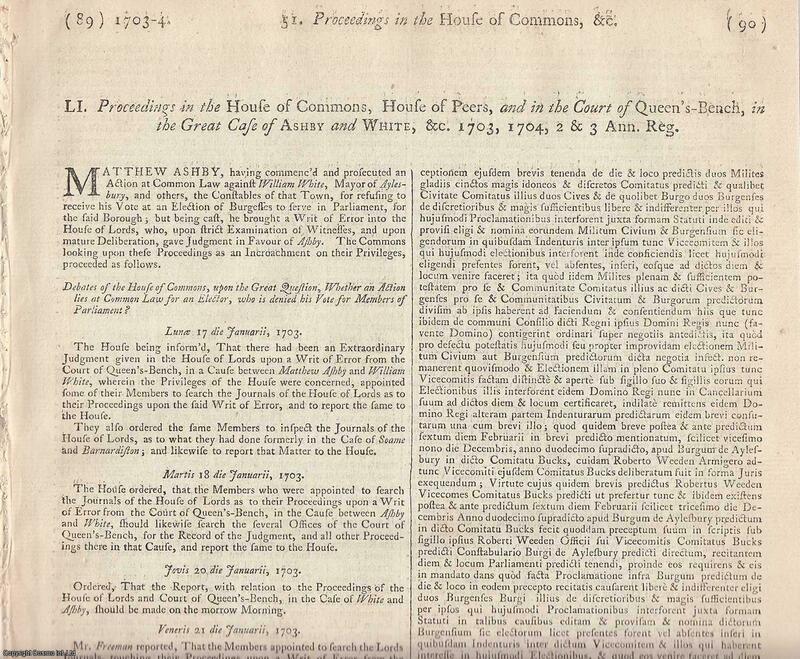 The House of Peers, in Westminster Hall, in full Parliament assembled, 15th, 16th, 19th, 20th, and 22nd Days of April, 1776. An original article from the Collected State Trials::Large Folio, 1779. Printed T. Wright, Essex Street, Strand; and Sold by G. Kearsley, No 46, near Serjeant's Inn, Fleet Street, London. 1779. Fourth Edition, Disbound. Very Good Condition. 66 pages. A report separated from A Complete Collection of State Trials, not a reprint or copy. Large folio (10 x 16 inches). Printed in double columns. Note; this is an original article separated from the volume, not a reprint or copy. Size: Large folio (10 x 16 inches). 66 pages. Quantity Available: 1. Category: State Trials::Large Folio; True Crime; Printed before 1800; New Arrivals; Inventory No: 231931. 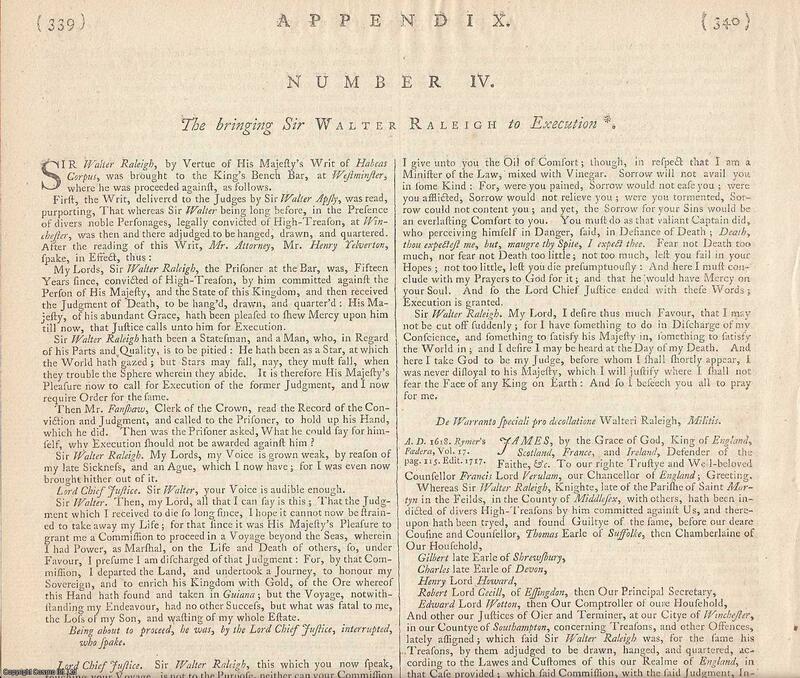 BLACK ACT TRIAL.The Trial of William Barnard, at the Sessions House in the Old Bailey on Wednesday the 10th, and Thursday the 11th of May, 1758 on the Black Act; for sending a Letter in the fictitious Name to Charles, Duke of Marlborough, demanding a genteel Support for Life. An original article from the Collected State Trials::Large Folio, 1779. Printed T. Wright, Essex Street, Strand; and Sold by G. Kearsley, No 46, near Serjeant's Inn, Fleet Street, London. 1779. Fourth Edition, Disbound. Very Good Condition. 8 pages. A report separated from A Complete Collection of State Trials, not a reprint or copy. Large folio (10 x 16 inches). Printed in double columns. Note; this is an original article separated from the volume, not a reprint or copy. Size: Large folio (10 x 16 inches). 8 pages. Quantity Available: 1. Category: State Trials::Large Folio; True Crime; Printed before 1800; Inventory No: 231918. BOOKSELLER LIBEL.The Trial of William Owen, Bookseller, for Printing and Publishing a Libel, intituled, The Case of Alexander Murray, Esq. 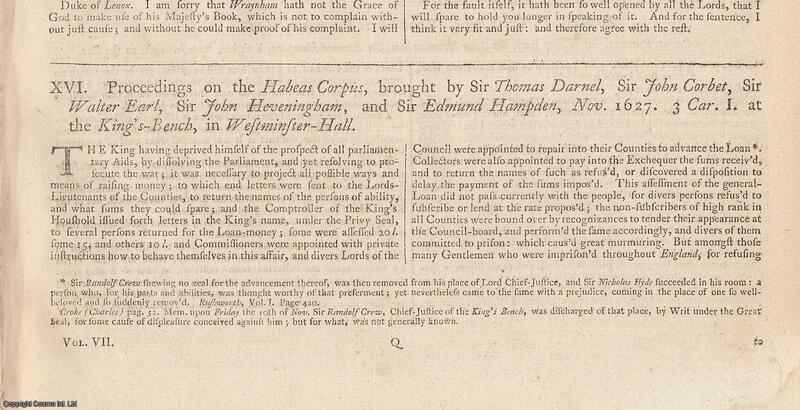 on an Information tried at Guildhall, London, Monday, July 6, 1752, before the Right Honourable the Lord Chief Justice Lee. 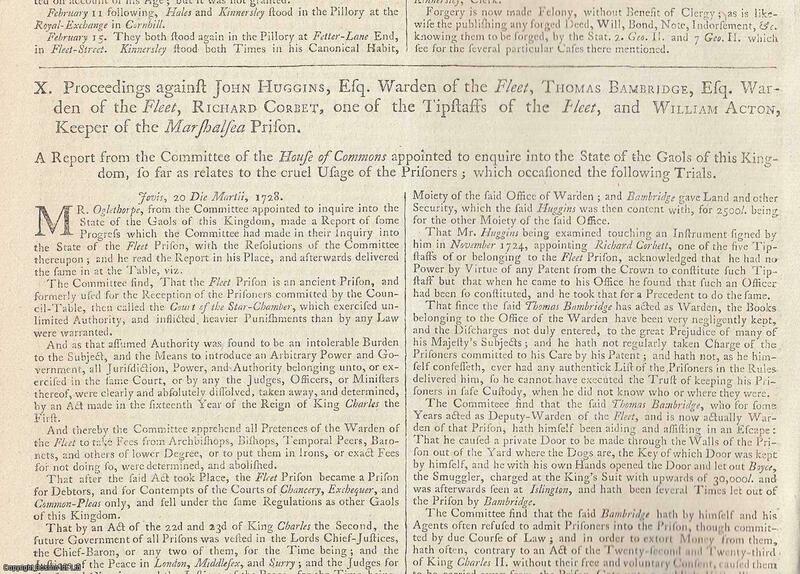 An original article from the Collected State Trials::Large Folio, 1779. Printed T. Wright, Essex Street, Strand; and Sold by G. Kearsley, No 46, near Serjeant's Inn, Fleet Street, London. 1779. Fourth Edition, Disbound. Very Good Condition. 7 pages. A report separated from A Complete Collection of State Trials, not a reprint or copy. Large folio (10 x 16 inches). Printed in double columns. Note; this is an original article separated from the volume, not a reprint or copy. Size: Large folio (10 x 16 inches). 7 pages. Quantity Available: 1. Category: State Trials::Large Folio; True Crime; Printed before 1800; Inventory No: 231925. CHARLES THE FIRST, PARLIAMENTARY CRISIS.Proceedings on the Habeas Corpus, brought by Sir Thomas Darnel, Sir John Corbet, Sir Walter Earl, Sir John Heveningham, & Sir Edmund Hampden, Nov 1627ALONG WITH A Conference desired by the Lords, and had by a Committee of both Houses, concerning the Rights and Privileges of the Subjects. Sir Dudley Digges. 1628. An original article from the Collected State Trials::Large Folio, 1778. Printed T. Wright, Essex Street, Strand; and Sold by G. Kearsley, No 46, near Serjeant's Inn, Fleet Street, London. 1778. Fourth Edition, Disbound. Very Good Condition. 51 pages. A report separated from A Complete Collection of State Trials, not a reprint or copy. Large folio (10 x 16 inches). Printed in double columns. Note; this is an original article separated from the volume, not a reprint or copy. Size: Large folio (10 x 16 inches). 51 pages. Quantity Available: 1. Category: State Trials::Large Folio; True Crime; Printed before 1800; New Arrivals; Inventory No: 231894. 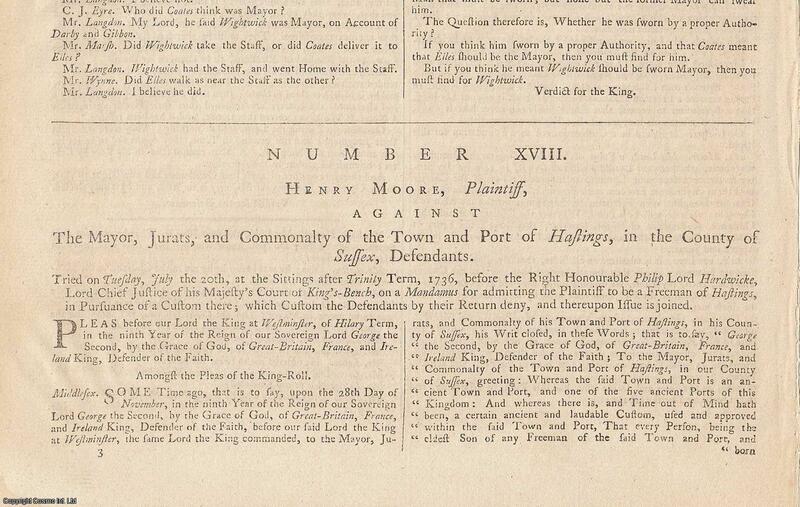 CINQUE PORTS.Henry Moore, Plaintiff, against The Mayor, Jurats, and Community of the Town and Port of Hastings, in the County of Sussex, Defendants. Tuesday, July the 20th, 1736. An original article from the Collected State Trials::Large Folio, 1779. Printed T. Wright, Essex Street, Strand; and Sold by G. Kearsley, No 46, near Serjeant's Inn, Fleet Street, London. 1779. Fourth Edition, Disbound. Very Good Condition. 20 pages. A report separated from A Complete Collection of State Trials, not a reprint or copy. Large folio (10 x 16 inches). Printed in double columns. Note; this is an original article separated from the volume, not a reprint or copy. Size: Large folio (10 x 16 inches). 20 pages. Quantity Available: 1. Category: State Trials::Large Folio; True Crime; Printed before 1800; Inventory No: 231924. COVENTRY ACT CONVICTION.The Trial of John Woodburne and Arundel Coke, Esq: at Suffolk Assizes for felony, in wilfully slitting the Nose of Edward Crispe, Gent. March 13, 1721. 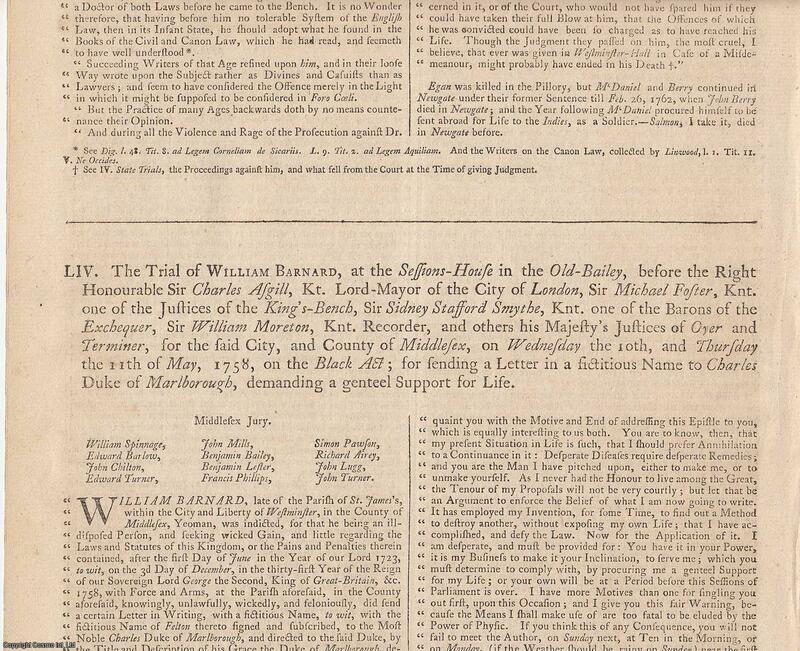 An original article from the Collected State Trials::Large Folio, 1777. Printed T. Wright, Essex Street, Strand; and Sold by G. Kearsley, No 46, near Serjeant's Inn, Fleet Street, London. 1777. Fourth Edition, Disbound. Very Good Condition. 9 pages. A report separated from A Complete Collection of State Trials, not a reprint or copy. Large folio (10 x 16 inches). Printed in double columns. Note; this is an original article separated from the volume, not a reprint or copy. Size: Large folio (10 x 16 inches). 9 pages. Quantity Available: 1. Category: State Trials::Large Folio; True Crime; Printed before 1800; Inventory No: 231889. DECLARATION OF INDULGENCE.The Trial of the Seven Bishops. 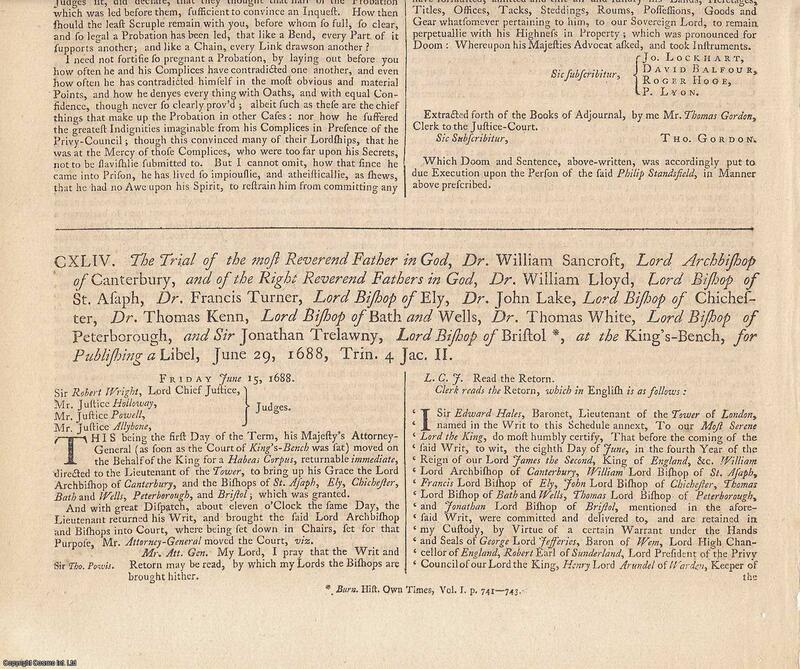 Dr William Sancroft... Dr. William Lloyd... Dr. Francis Turner... Dr. John Lake... Dr. Thomas Kenn... Dr. Thomas White... & Sir Jonathan Trelawny..., at the King's Bench, for Publishing a Libel, June 29, 1688. 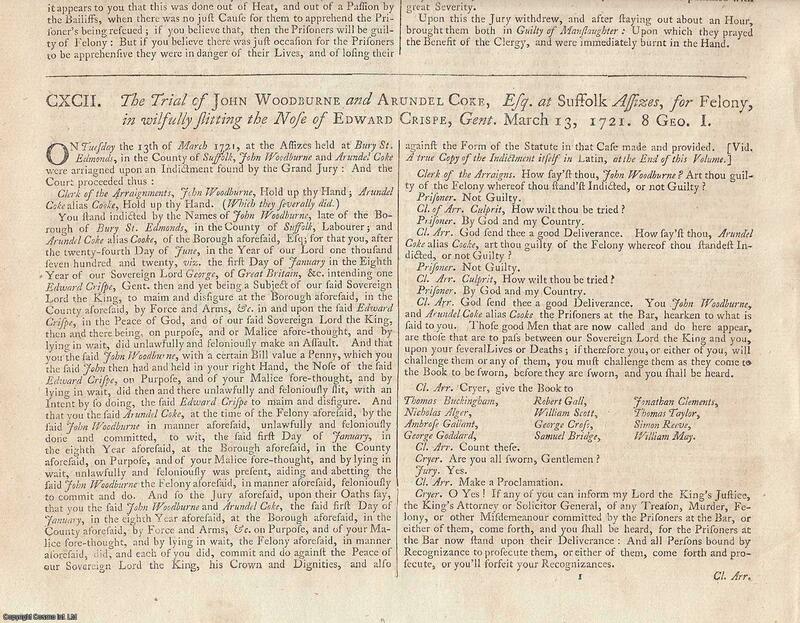 An original article from the Collected State Trials::Large Folio, 1777. Printed T. Wright, Essex Street, Strand; and Sold by G. Kearsley, No 46, near Serjeant's Inn, Fleet Street, London. 1777. Fourth Edition, Disbound. Very Good Condition. 47 pages. A report separated from A Complete Collection of State Trials, not a reprint or copy. Large folio (10 x 16 inches). Printed in double columns. Note; this is an original article separated from the volume, not a reprint or copy. Size: Large folio (10 x 16 inches). 47 pages. Quantity Available: 1. Category: State Trials::Large Folio; True Crime; Printed before 1800; New Arrivals; Inventory No: 231875. 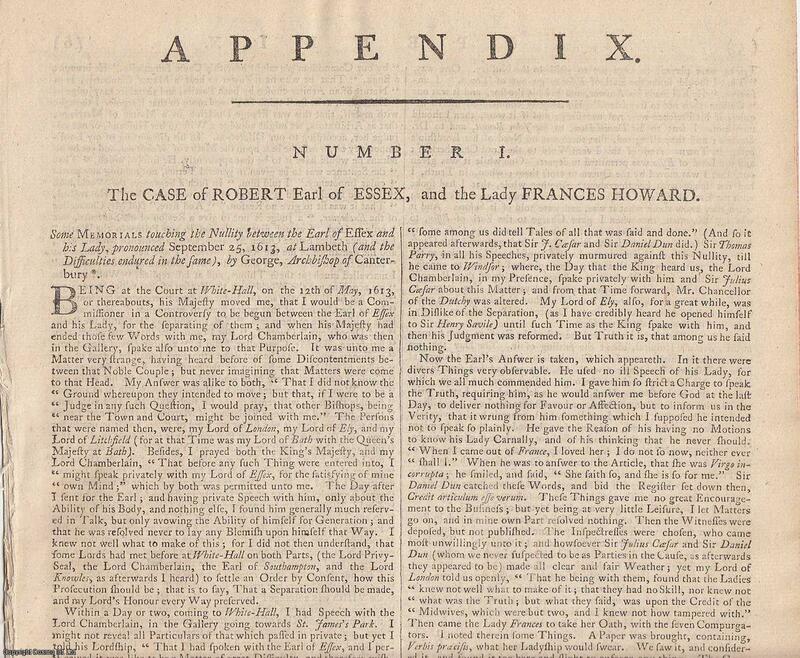 DIVORCE OF ROBERT DEVEREUX.The Case of Robert, Earl of Essex, and the Lady Frances Howard. 1613. An original article from the Collected State Trials::Large Folio, 1779. Printed T. Wright, Essex Street, Strand; and Sold by G. Kearsley, No 46, near Serjeant's Inn, Fleet Street, London. 1779. Fourth Edition, Disbound. Very Good Condition. 13 pages. A report separated from A Complete Collection of State Trials, not a reprint or copy. Large folio (10 x 16 inches). Printed in double columns. Note; this is an original article separated from the volume, not a reprint or copy. Size: Large folio (10 x 16 inches). 13 pages. Quantity Available: 1. Category: State Trials::Large Folio; True Crime; Printed before 1800; Inventory No: 231920. EL DORADO FAILURE. The bringing [of] Sir Walter Raleigh to Execution. 1618. An original article from the Collected State Trials::Large Folio, 1778. Printed T. Wright, Essex Street, Strand; and Sold by G. Kearsley, No 46, near Serjeant's Inn, Fleet Street, London. 1778. Fourth Edition, Disbound. Very Good Condition. 2 pages. A report separated from A Complete Collection of State Trials, not a reprint or copy. Large folio (10 x 16 inches). Printed in double columns. Note; this is an original article separated from the volume, not a reprint or copy. Size: Large folio (10 x 16 inches). 2 pages. Quantity Available: 1. Category: State Trials::Large Folio; True Crime; Printed before 1800; Inventory No: 231904. 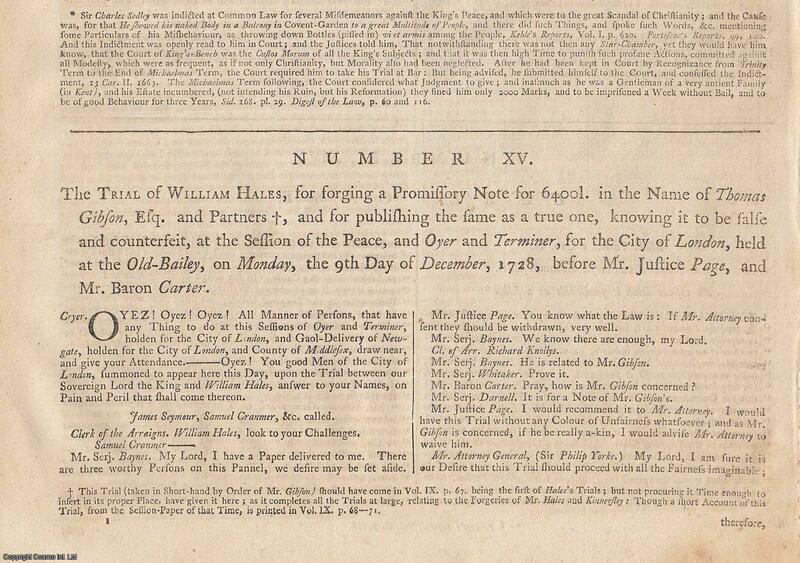 FORGERY.The Trial of William Hales, for forging a Promissory Note for 6400 l. in the Name of Thomas Gibson, Esq. and Partners, and for publishing the same as a true one, knowing it to be false and counterfeit, at the Session of the Peace, and Oyer and Terminer, for the City of London, held at the Old Bailey, on Monday, the 9th Day of December, 1728, before Mr Justice Page, and Mr Baron Carter. An original article from the Collected State Trials::Large Folio, 1779. Printed T. Wright, Essex Street, Strand; and Sold by G. Kearsley, No 46, near Serjeant's Inn, Fleet Street, London. 1779. Fourth Edition, Disbound. Very Good Condition. 13 pages. A report separated from A Complete Collection of State Trials, not a reprint or copy. Large folio (10 x 16 inches). Printed in double columns. Note; this is an original article separated from the volume, not a reprint or copy. Size: Large folio (10 x 16 inches). 13 pages. Quantity Available: 1. Category: State Trials::Large Folio; True Crime; Printed before 1800; Inventory No: 231923. 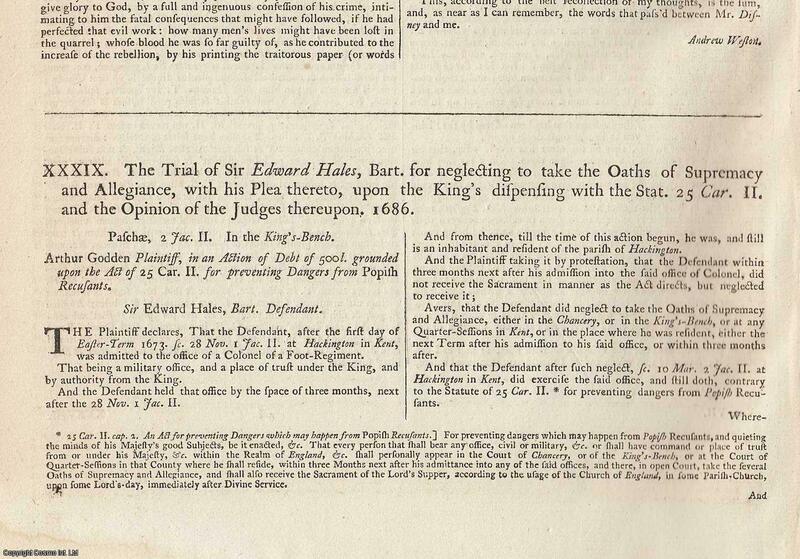 GLORIOUS REVOLUTION.The Trial of Sir Edward Hales, Bart. For neglecting to take the Oaths of Supremacy and Allegiance, with his Plea thereto, upon the King's dispensing with the Stat. 25 Car. II and the Opinion of the Judges thereupon, 1686. An original article from the Collected State Trials::Large Folio, 1778. Printed T. Wright, Essex Street, Strand; and Sold by G. Kearsley, No 46, near Serjeant's Inn, Fleet Street, London. 1778. Fourth Edition, Disbound. Very Good Condition. 18 pages. A report separated from A Complete Collection of State Trials, not a reprint or copy. Large folio (10 x 16 inches). Printed in double columns. Note; this is an original article separated from the volume, not a reprint or copy. Size: Large folio (10 x 16 inches). 18 pages. Quantity Available: 1. Category: State Trials::Large Folio; True Crime; Printed before 1800; Inventory No: 231898. 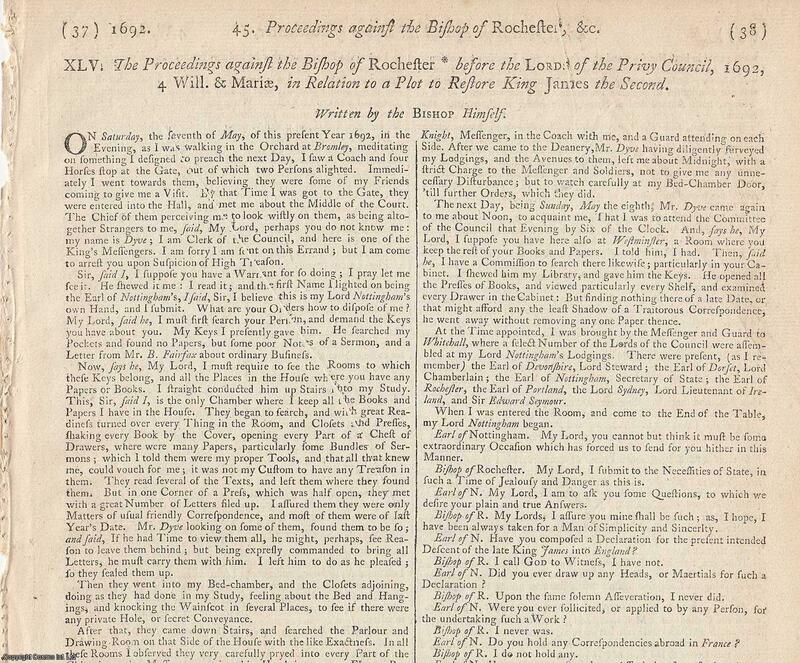 GLORIOUS REVOLUTION - FLOWERPOT PLOT.The Proceedings against the Bishop of Rochester [Thomas Sprat] before the Lords of the Privy Council, 1692, in Relation to a Plot to Restore King James the Second. Written by the Bishop Himself. An original article from the Collected State Trials::Large Folio, 1778. Printed T. Wright, Essex Street, Strand; and Sold by G. Kearsley, No 46, near Serjeant's Inn, Fleet Street, London. 1778. Fourth Edition, Disbound. Very Good Condition. 7 pages. A report separated from A Complete Collection of State Trials, not a reprint or copy. Large folio (10 x 16 inches). Printed in double columns. Note; this is an original article separated from the volume, not a reprint or copy. Size: Large folio (10 x 16 inches). 7 pages. Quantity Available: 1. Category: State Trials::Large Folio; True Crime; Printed before 1800; Inventory No: 231899. 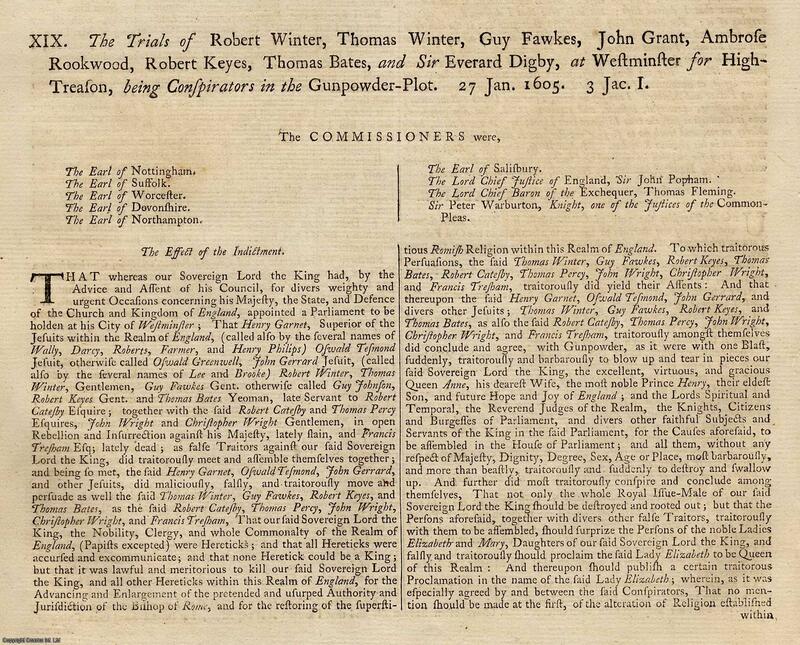 GUNPOWDER PLOT.The Trials of Robert Winter, Thomas Winter, Guy Fawkes, John Grant, Ambrose Rookwood, Robert Keyes, Thomas Bates & Sir Everard Digby, at Westmister for High Treason, being Conspirators in the Gunpowder Plot, 27 January, 1605. TOGETHER WITH The Trial of Henry Garnet, Superior of the Jesuits in England, at the Guild Hall of London, for High Treason, being a Conspirator in the Gunpowder Plot, 28 March 1606. An original article from the Collected State Trials::Large Folio, 1776. Printed T. Wright, Essex Street, Strand; and Sold by G. Kearsley, No 46, near Serjeant's Inn, Fleet Street, London. 1776. Fourth Edition, Disbound. Very Good Condition. 40 pages. A report separated from A Complete Collection of State Trials, not a reprint or copy. Large folio (10 x 16 inches). Printed in double columns. Note; this is an original article separated from the volume, not a reprint or copy. Size: Large folio (10 x 16 inches). 40 pages. Quantity Available: 1. Category: State Trials::Large Folio; True Crime; Printed before 1800; New Arrivals; Inventory No: 231853. LADY ARABELLA STUART.Proceedings against Mary, Countess of Shrewsbury, before a select Council, for a Contempt in refusing to answer fully before the Privy Council, or to subscribe her Examination. 1614. An original article from the Collected State Trials::Large Folio, 1779. Printed T. Wright, Essex Street, Strand; and Sold by G. Kearsley, No 46, near Serjeant's Inn, Fleet Street, London. 1779. Fourth Edition, Disbound. Very Good Condition. 2 pages. A report separated from A Complete Collection of State Trials, not a reprint or copy. Large folio (10 x 16 inches). Printed in double columns. Note; this is an original article separated from the volume, not a reprint or copy. Size: Large folio (10 x 16 inches). 2 pages. Quantity Available: 1. Category: State Trials::Large Folio; True Crime; Printed before 1800; Inventory No: 231928. LEEWARD ISLANDS MURDER.The Trial of John Barbot, Attorney at Law, for the Murder of Matthew Mills, Esq. at a Court of Oyer and Terminer and General Gaol-Delivery, held at the Town of Basseterre, in and for the Island of St. Christopher, on Friday the 5th Day of January, 1753, before the Honourable William Matthew Burt, Esq. 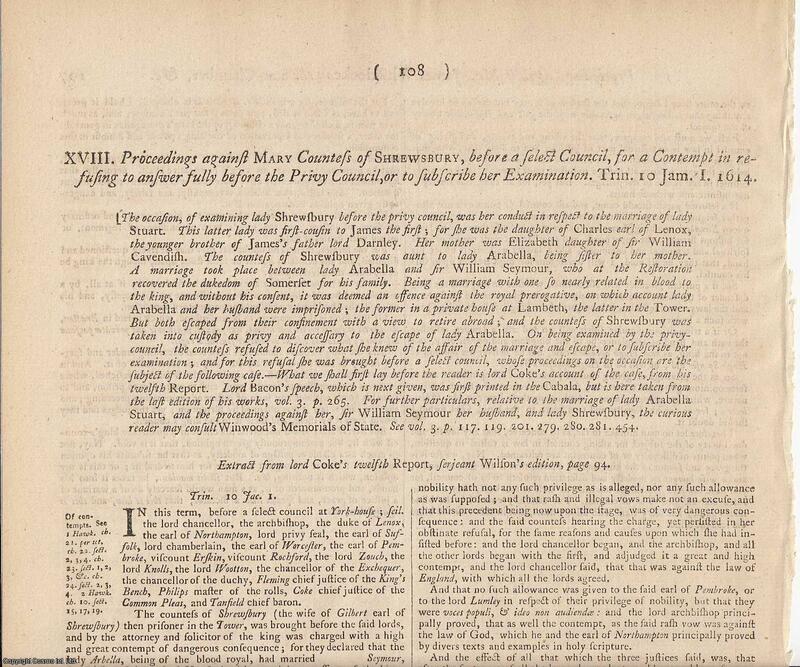 President of his Majesty's Council of the said Island, and others, his Majesty's Justices of Gaol-Delivery.Published by Permission of the Judges. An original article from the Collected State Trials::Large Folio, 1779. Printed T. Wright, Essex Street, Strand; and Sold by G. Kearsley, No 46, near Serjeant's Inn, Fleet Street, London. 1779. Fourth Edition, Disbound. Very Good Condition. 21 pages. A report separated from A Complete Collection of State Trials, not a reprint or copy. Large folio (10 x 16 inches). Printed in double columns. Note; this is an original article separated from the volume, not a reprint or copy. Size: Large folio (10 x 16 inches). 21 pages. Quantity Available: 1. Category: State Trials::Large Folio; True Crime; Printed before 1800; New Arrivals; Inventory No: 231917. THE LEVANT COMPANY.The Case of Impositions, on an Information in the Exchequer by the Attorney General against Mr John Bates, Merchant. 1604. 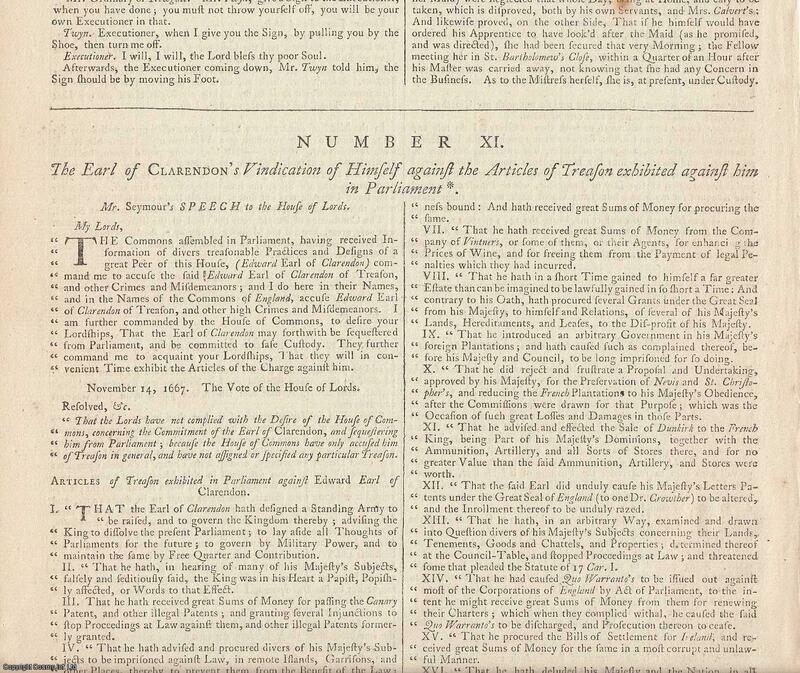 An original article from the Collected State Trials::Large Folio, 1779. Printed T. Wright, Essex Street, Strand; and Sold by G. Kearsley, No 46, near Serjeant's Inn, Fleet Street, London. 1779. Fourth Edition, Disbound. Very Good Condition. 37 pages. A report separated from A Complete Collection of State Trials, not a reprint or copy. Large folio (10 x 16 inches). Printed in double columns. Note; this is an original article separated from the volume, not a reprint or copy. Size: Large folio (10 x 16 inches). 37 pages. Quantity Available: 1. Category: State Trials::Large Folio; True Crime; Printed before 1800; New Arrivals; Inventory No: 231926. LEVELLERS & FREEBORN RIGHTS. 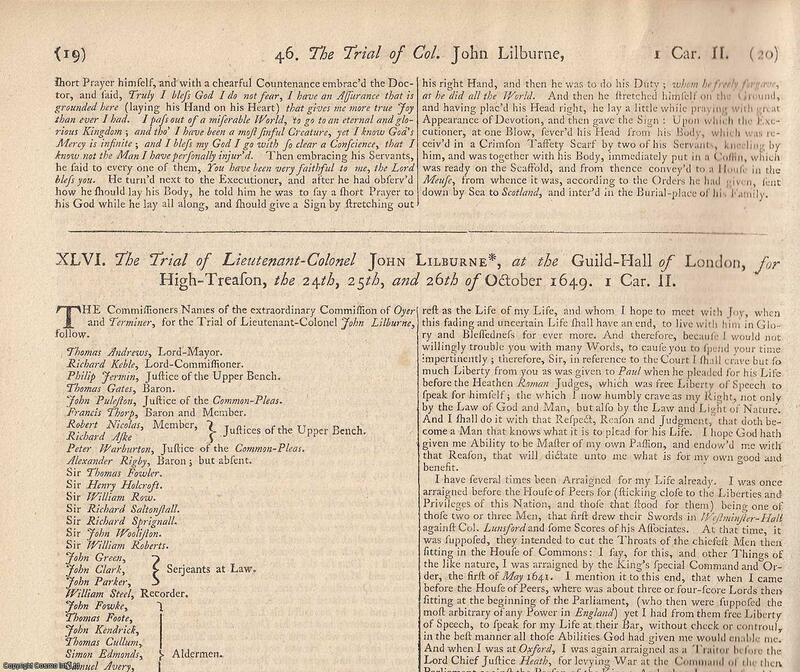 The Trial of Lieutenant-Colonel John Lilburne, at the Guild Hall of London, for High Treason, the 24th, 25th, and 26th of October 1649. Along with The Examination of the Jury who try'd Lietenant-Colonel John Lilburne. 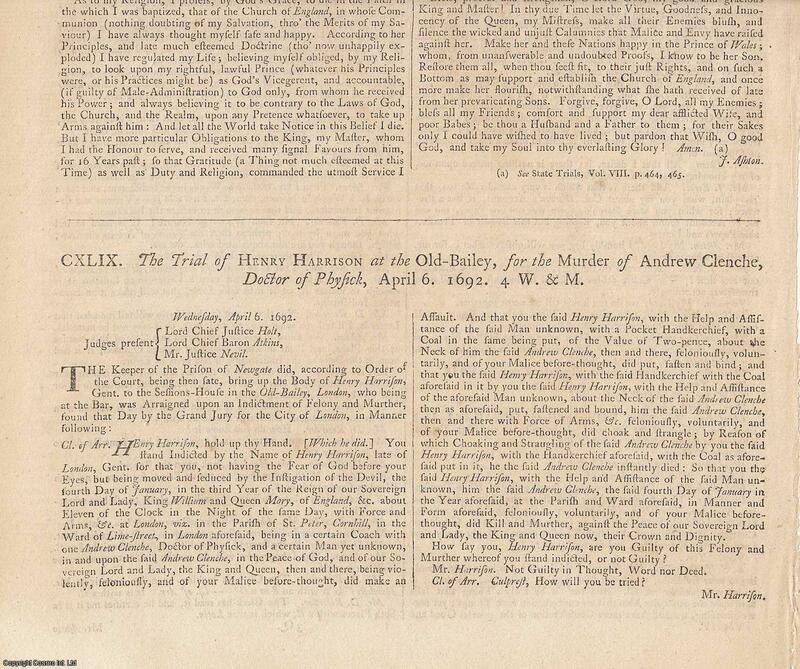 An original article from the Collected State Trials::Large Folio, 1776. Printed T. Wright, Essex Street, Strand; and Sold by G. Kearsley, No 46, near Serjeant's Inn, Fleet Street, London. 1776. Fourth Edition, Disbound. Very Good Condition. 32 pages. A report separated from A Complete Collection of State Trials, not a reprint or copy. Large folio (10 x 16 inches). Printed in double columns. Note; this is an original article separated from the volume, not a reprint or copy. Size: Large folio (10 x 16 inches). 32 pages. Quantity Available: 1. Category: State Trials::Large Folio; True Crime; Printed before 1800; New Arrivals; Inventory No: 231861. LIBELLOUS BOOKS 1633-1663.An intriguing selection of State Trials & Reports, featuring the (in)famous Trial of William Prynn for publishing and writing Histriomastix in 1633 and the Trial of John Twyn and others in 1663. 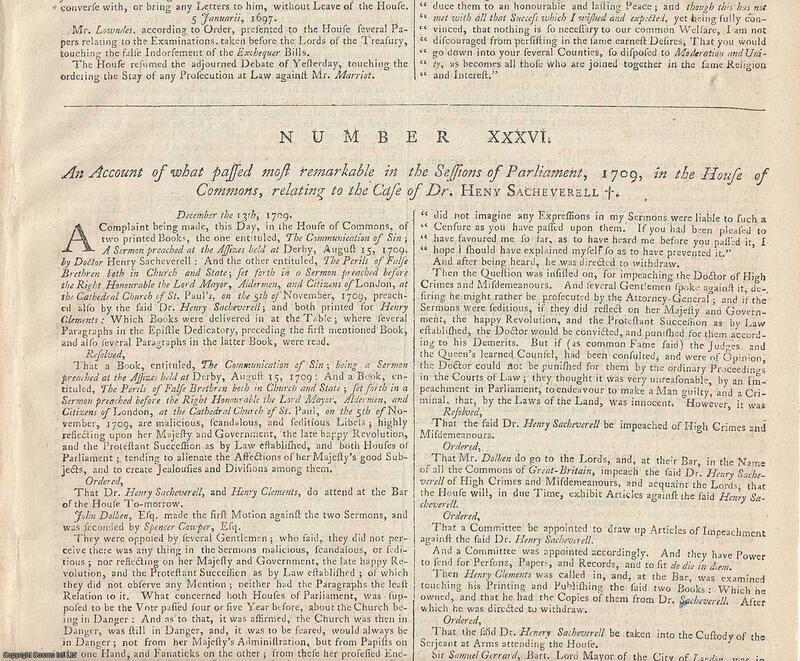 An original article from the Collected State Trials::Large Folio, 1776. Printed T. Wright, Essex Street, Strand; and Sold by G. Kearsley, No 46, near Serjeant's Inn, Fleet Street, London. 1776. Fourth Edition, Disbound. Very Good Condition. 18 pages. Large folio (10 x 16 inches). Printed in double columns. Note; this is an original article separated from the volume, not a reprint or copy. Contains : LIBELLOUS BOOKS. 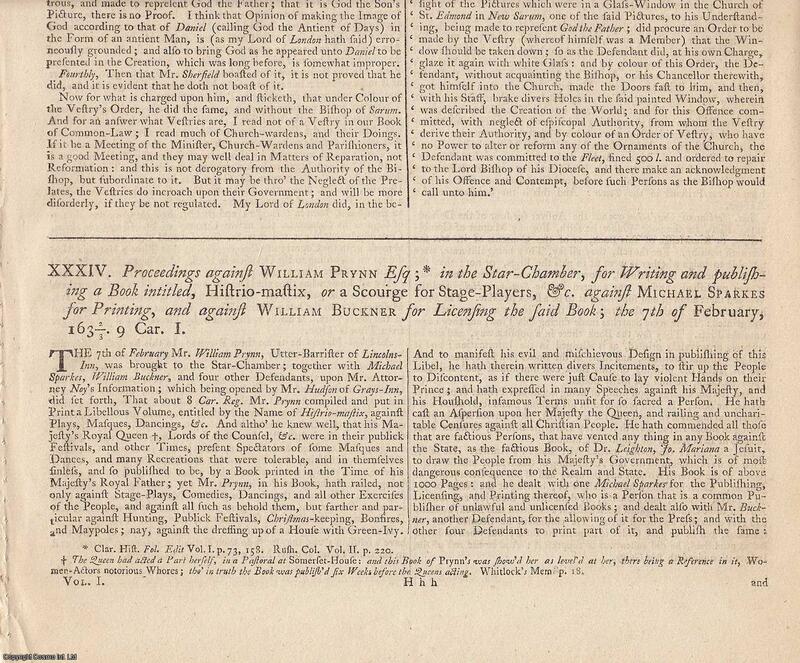 Proceedings against Wm Prynn in the Star Chamber, for Writing & Publishing a Book intitled, Histriomastix, or a Scourge for Stage-Players, &c. against Michael Sparkes for Printing, and against Wm Buckner for Licensing the said Book; 7th Feb 1633 : LIBELLOUS BOOKS. 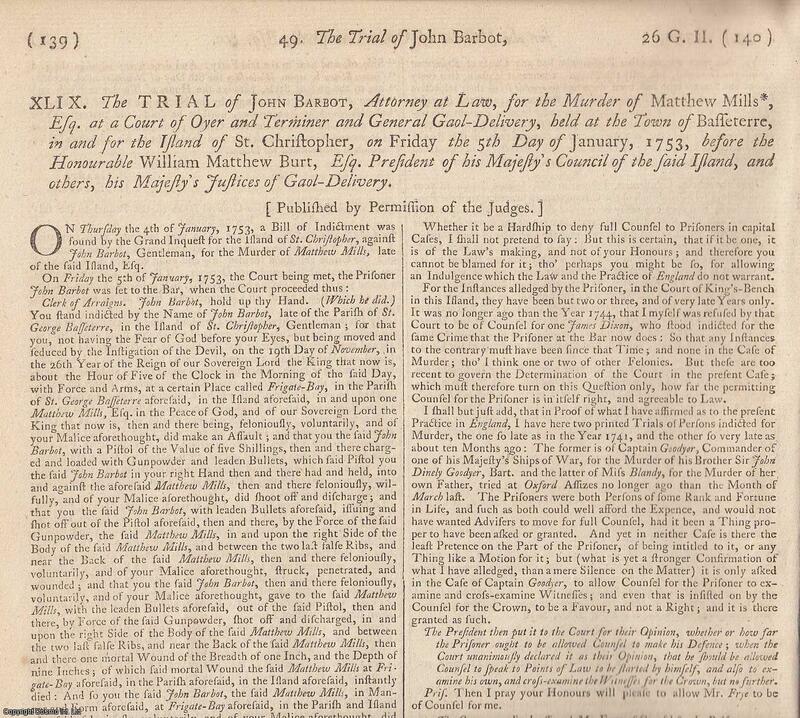 The Trials of John Twyn Printer, for High Treason; of Thomas Brewster Bookseller, Simon Dover Printer, Nathan Brooks Bookbinder, for Misdemeanours; at the Old Bailey, the 20th & 22nd of February 1663. Size: Large folio (10 x 16 inches). 18 pages. Quantity Available: 1. Category: State Trials::Large Folio; True Crime; Printed before 1800; New Arrivals; Inventory No: 231938. 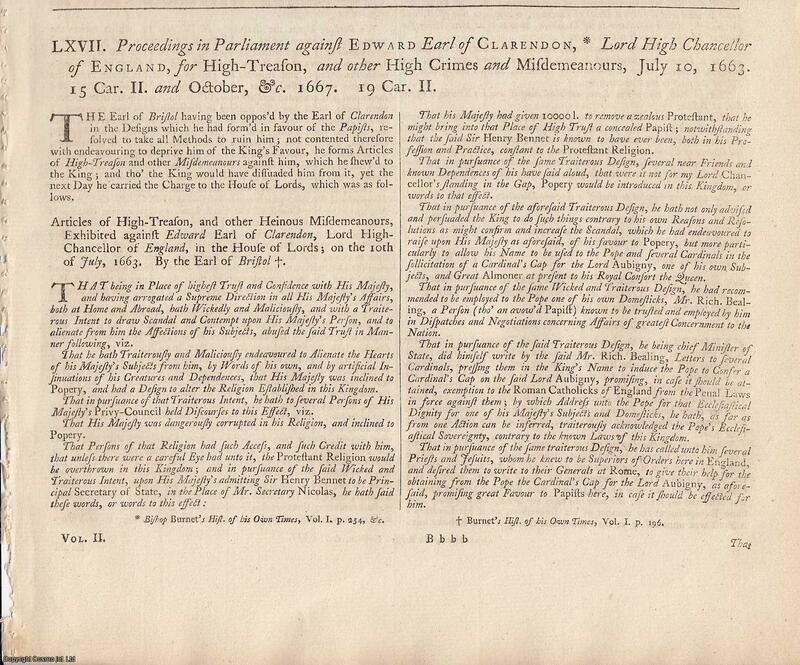 LORDS PROPRIETOR OF THE COLONY OF CAROLINA.Proceedings in Parliament against Edward Earl of Clarendon, Lord High Chancellor of England, for High Treason, and other High Crimes and Misdemeanours, July 10, 1663 and October, &c., 1667. 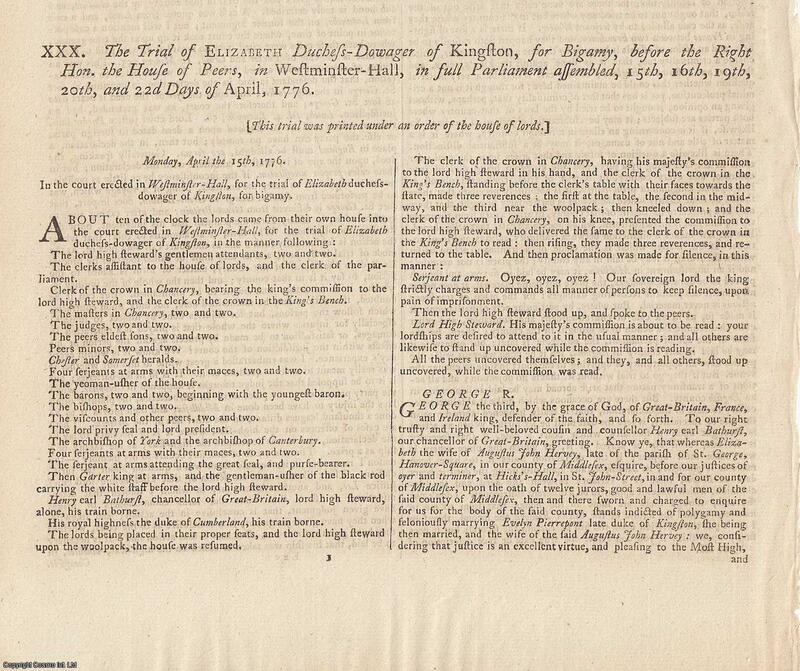 An original article from the Collected State Trials::Large Folio, 1776. Printed T. Wright, Essex Street, Strand; and Sold by G. Kearsley, No 46, near Serjeant's Inn, Fleet Street, London. 1776. Fourth Edition, Disbound. Very Good Condition. 16 pages. A report separated from A Complete Collection of State Trials, not a reprint or copy. Large folio (10 x 16 inches). Printed in double columns. Note; this is an original article separated from the volume, not a reprint or copy. Size: Large folio (10 x 16 inches). 16 pages. Quantity Available: 1. Category: State Trials::Large Folio; True Crime; Printed before 1800; Inventory No: 231864. 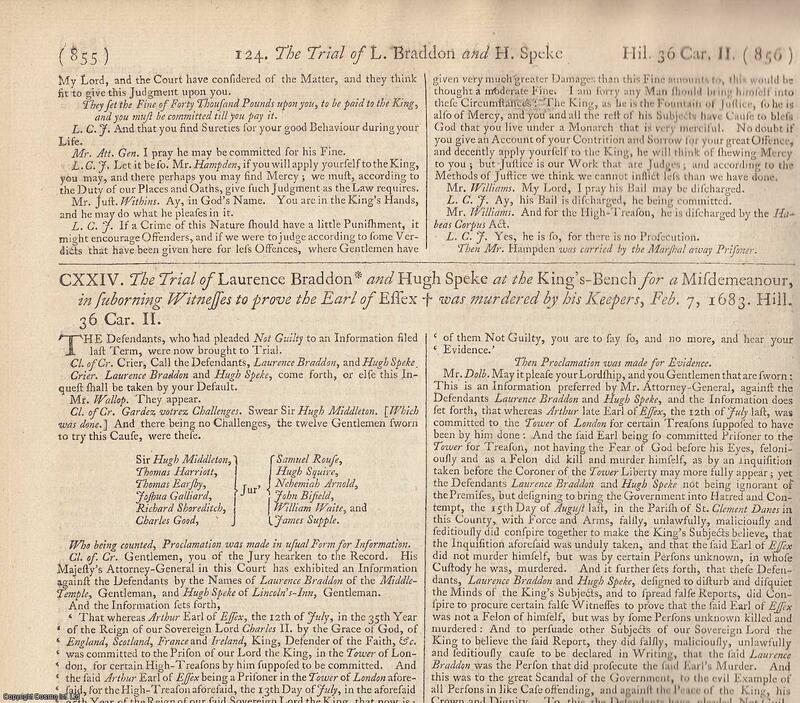 MURDER NOTED BY JOHN EVELYN.The Trial of Henry Harrison at the Old Bailey, for the Murder of Andrew Clenche, Doctor of Physic, April 6 1692 ALONG WITH The Trial of John Cole, at the Old Bailey, for the Murder of Andrew Clenche, Doctor of Physick, Sept 2 1692. 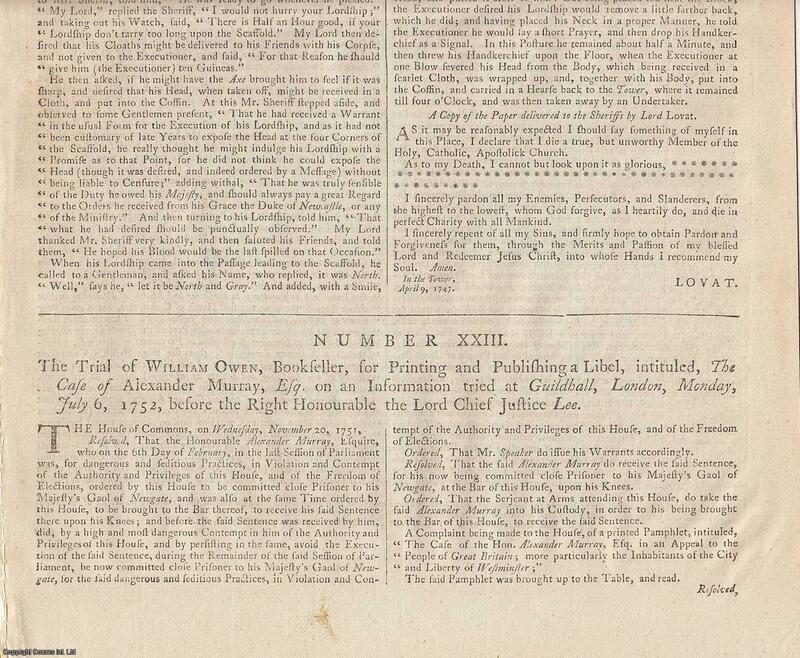 An original article from the Collected State Trials::Large Folio, 1777. Printed T. Wright, Essex Street, Strand; and Sold by G. Kearsley, No 46, near Serjeant's Inn, Fleet Street, London. 1777. Fourth Edition, Disbound. Very Good Condition. 12 pages. A report separated from A Complete Collection of State Trials, not a reprint or copy. Large folio (10 x 16 inches). Printed in double columns. Note; this is an original article separated from the volume, not a reprint or copy. Size: Large folio (10 x 16 inches). 12 pages. Quantity Available: 1. Category: State Trials::Large Folio; True Crime; Printed before 1800; Inventory No: 231877.